Music festivals are certainly popular. Every thing I'm reading on the internet at the moment, whether it's fashion or music or getaways is breathlessly commentating on them. Who's appearing at a festival near you? See what your favourite celebs were wearing at Coachella! There seems to be a cultural yearning for an idealised urban version of the countryside which combines the best bits of city living, (music, fashion, cool people) with the best bits of a rural life, (open air, space, trees). I absolutely loathe outdoor music festivals! Proper hate them. Really. In ten years of working on festivals, I can safely say that I remember one mud free festival. One! Usually they're just a grim struggle against the odds. Just walking through the mud to catering requires herculean effort. It's a struggle to keep the rain off your equipment. It's a struggle to keep clean. Every simple task just becomes a monumental effort. There was the notable time where I got stuck in the mud and I quite literally couldn't move. It was late at night and I'd finished work so I was on my own & the site was relatively deserted. It'd been raining heavily the previous two days but on that particular day the rain had stopped so the mud was starting to dry out and had become extremely sticky. It had been very hard work walking through this one field because it had been churned up by the heavy vehicles and the sheer amount of people moving through it. I reached a point where I couldn't actually move my legs. The mud was so deep and so sticky that every time I tried to move my legs, I fell forward onto my hands. Late at night, dark, no one around and I couldn't move - I don't mind telling you, I was scared. Thank god I had my phone in my back pocket and after a number of tries I was able to get hold of my crew boss who came & found me and literally pulled me out of the mud by my arms. And that is one of the many reasons why I hate festivals. 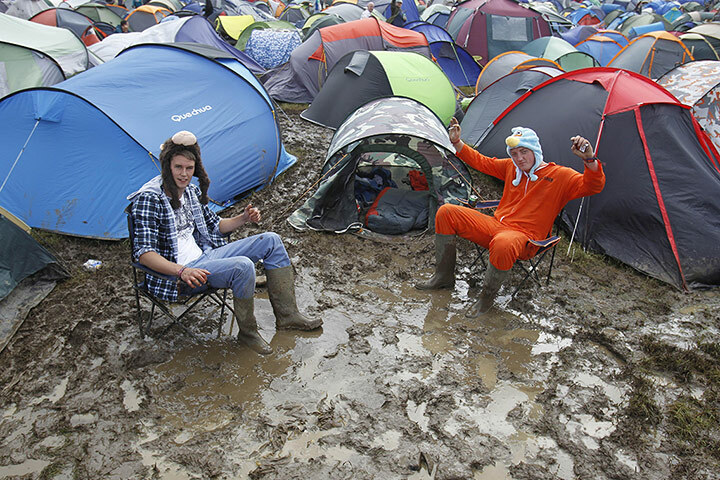 My advice, as a seasoned Glastonbury veteran, is to stay at home and watch it on TV. That's what I'll be doing, lol!